The moment that South Vietnamese National Police Chief Brig. 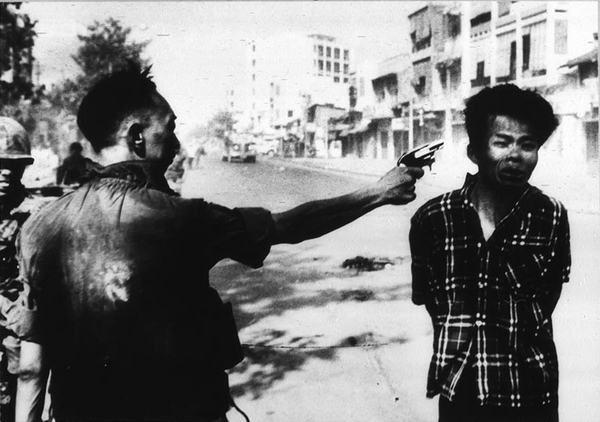 Gen. Nguyen Ngoc Loan executes a Viet Cong officer with a single pistol shot in the head is pictured. The Viet Cong officer grimaces at the impact of the fatal bullet. Carrying a pistol and wearing civilian clothes, the Vietcong Guerrilla was captured, identified as an officer and taken to the police chief. Edward T. Adams, "Viet Cong Officer Executed," in POYi Archive, Item #6471, http://archive.poy.org/items/show/6471 (accessed April 18, 2019).